This entry was posted in Uncategorized on July 17, 2016 by AJ. 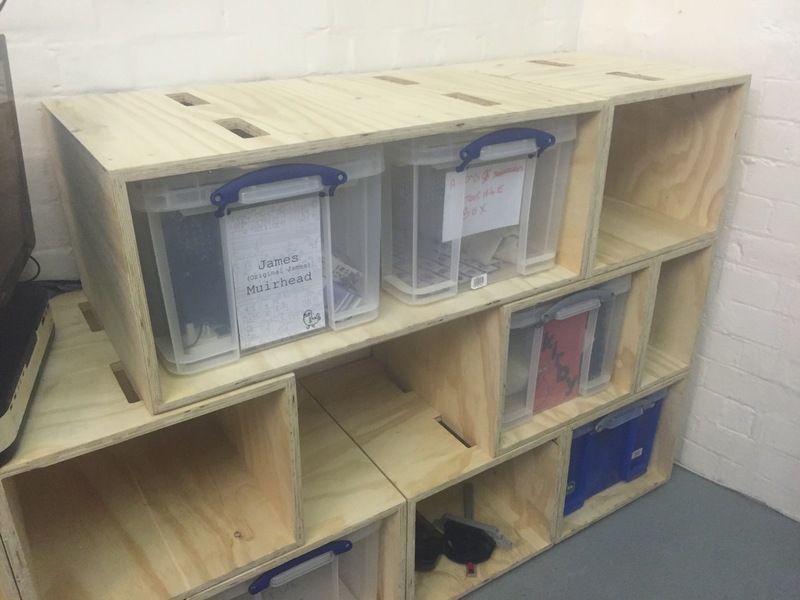 A while back when the Sheffield Hardware Hackers and Makers where still meeting up at Access Space Andy, the person running the group drew up some plans to make a storage system that would utilise a minimal amount of space in a small work area, they are called GoBoxes. 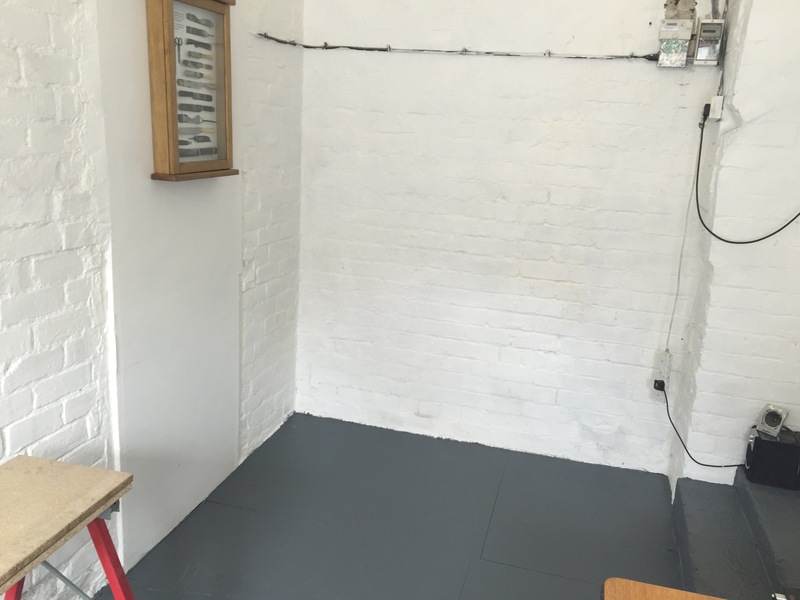 Now that we have our own space and we can call ourself a Hackspace and with a with space starting to become a premium with an infill of new members, more people means more storage. The drawing had not yet been made in real life so this was a perfect opportunity to start and implement the design. 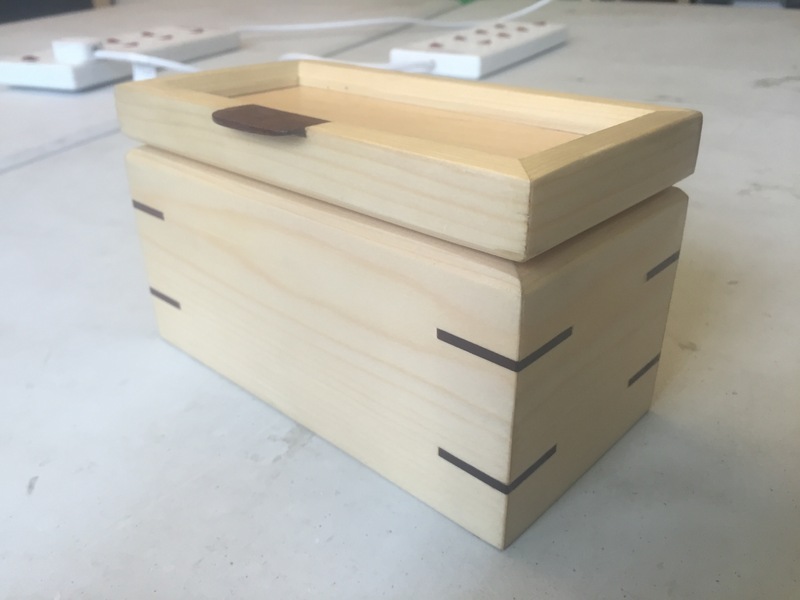 The GoBoxes are designed to be manufactured using a full sheet CNC router but as we don’t have one *yet* and I do a lot of joinery I would be making them by hand. I made a fair few changes to Andy’s original version, mainly increasing tolerances as it’s not to hard to gain or loose a mm when working with wood. When stacked together the individual boxes create a modular storage system. 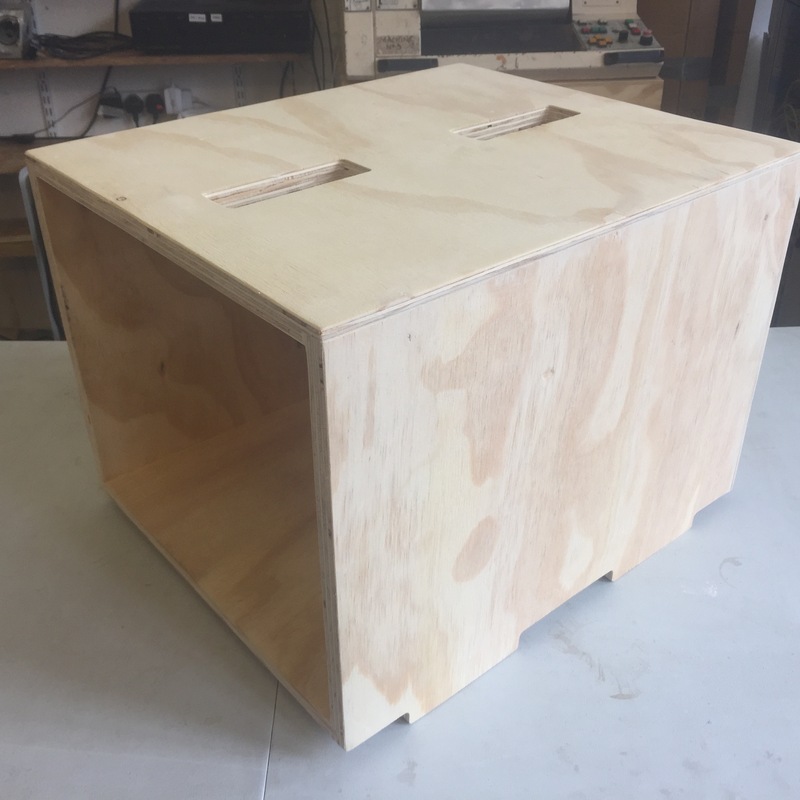 Each side of every box has a set of two feet and a top with two rectangular slots routed out on the centre, this allows them to be stacked up off set from one another just like Lego bricks. They are designed to hold a 35 litre Really Useful Box, the type that you can hang suspension files in. There are 3 different widths of GoBox, the single, a half to fill in the gaps on either end and a double witch allows you to bridge a gap between two singles. Using these three stackable modules lets you make a storage system that works around you. Currently we have a row of two singles with a half on either side and 4 PC’s on top. This gives us a flexible working area. 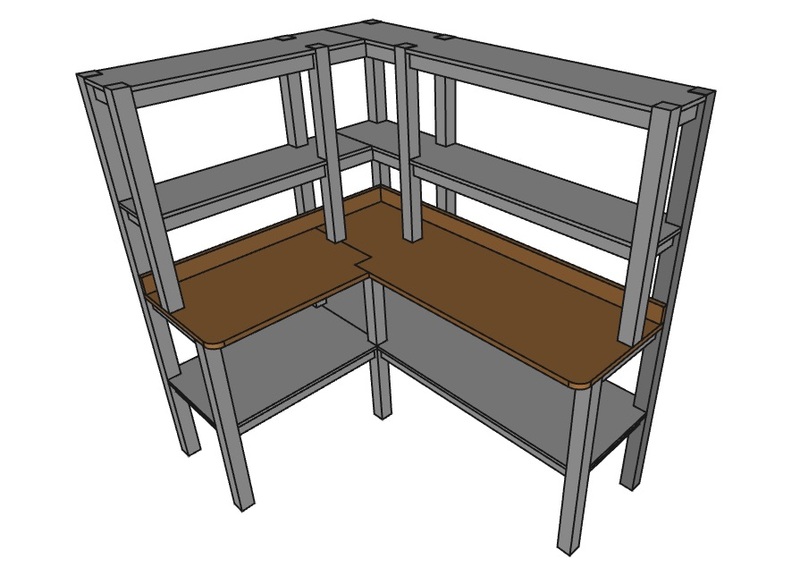 In the long term we can add another two rows of singles and leave out gaps for the workstations to sit in then bridge the gap with a double making them standing desks. If you where to remove a box from the middle of two rows of GoBoxes you’ve got yourself a seat with arm rests or even make a massive dividing wall with them. In a way it is just like playing with giant Lego bricks you can stack them however you want. For more build images visit my Flicker page! Links to the files for the parts can be found on Andys Git Hub page here. 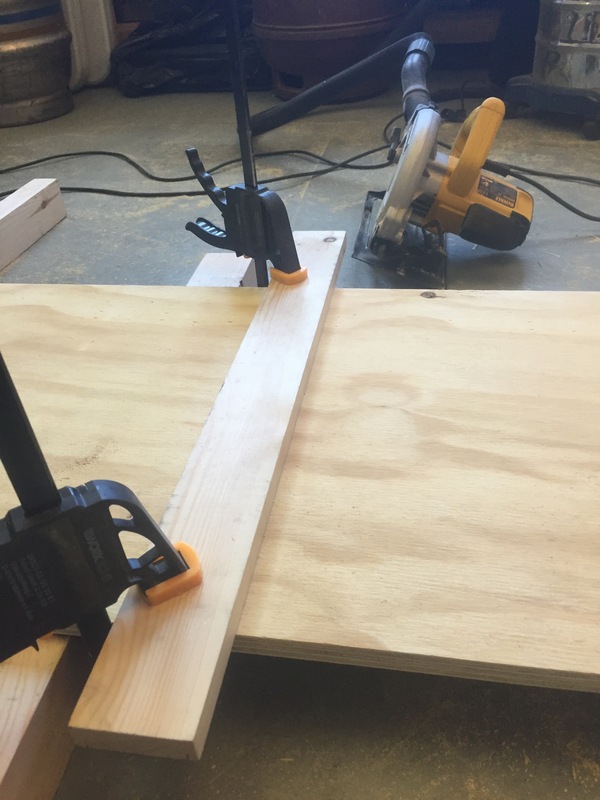 This entry was posted in Joinery on April 17, 2016 by AJ. 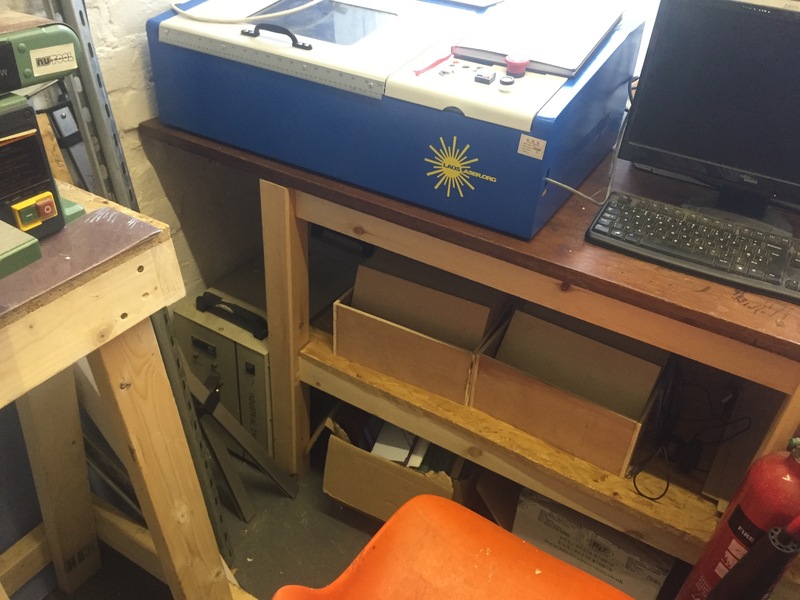 The Sheffield Hackspace have a bench top CNC lathe that lives in the corner of the space on a pair of trestles. The machine is not currently operational and is awaiting repair, it also has a fair bit of weight to it so requires two people to manoeuvre it. The space needs to be flexible so this means things need to be easy to move about for different events etc. 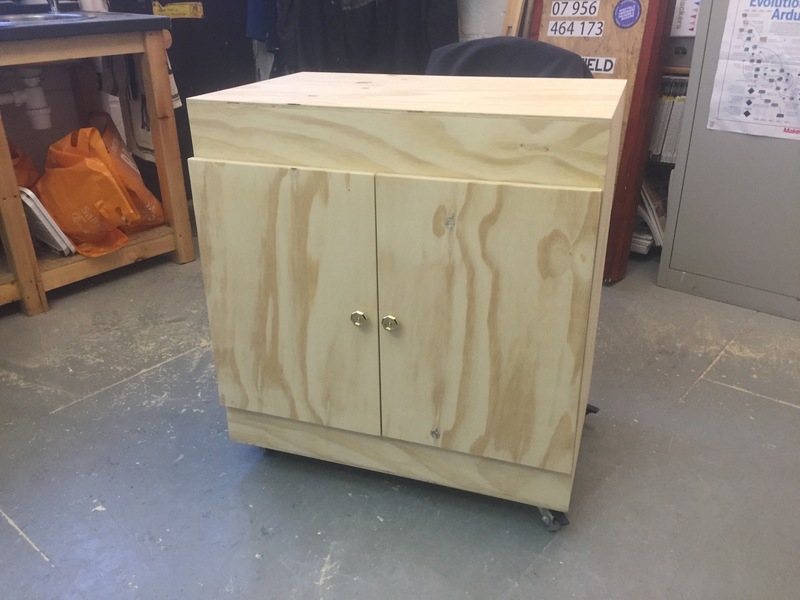 With the space ever expanding space is coming as a premium and with this in mind I came up with a solution to make a cabinet on castors with storage below for tooling with the CNC lathe sat on top. I took some measurements and drew a CAD model using FreeCAD. 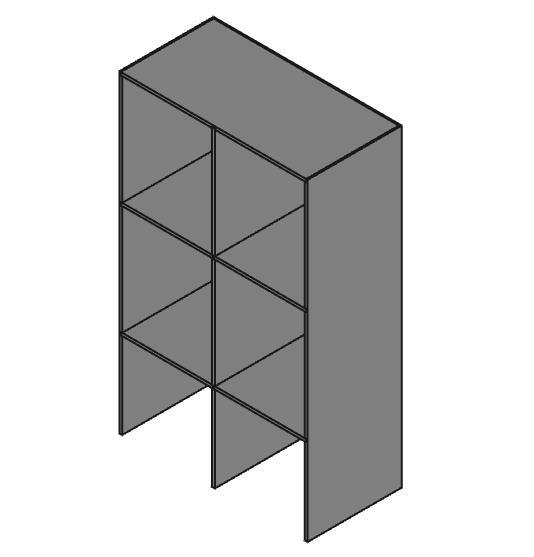 The cabinet was constructed using rebate joints on the top, bottom and back. The panel rebated in to the centre helps take the weight on the top, the two lengths of material on the front top and bottom help improve the structural strength, the cabinet will be made using 18mm construction ply. Two full sheets of ply where used for this project, I started by ripping all of parts to size by using a straight edge and a circular saw. For routing the rebates running along the centre of the base, back and top I used the same method, being sure to take in to consideration the width between the widest point of the cutter and the edge of the routers base and subtracting this away from the centre of the work piece. With the external rebates that ran around the perimeter of the base, top and back I used the routers fences set at 18mm from the cutter. I took the cut in two passes to make it easier on the cutter. I put an 18 x 100mm notch in the top and bottom of all of the three front vertical panels to accept the two lengths of ply that would improve the structure trength, I did this using the band saw. Now I had all of the parts machines I did a quick dry fit to ensure that all of the parts fitted together as anticipated before glueing up. I also sanded all of the internal surfaces with some 80 grit sand paper. I started the assembly process by fixing the top and base to the back and middle vertical section, before this I drew a light pencil line between the centre of all of the the rebates, I used a combination square to do all of the external ones and a ruler to do the rebates in the middle of the base back and top, this was so I knew exactly where to shoot the staples in to. I then spread wood glue over the joints and held them together with 50mm staples whilst the glue set. Now I had the cabinet frame assembled I hung the doors and mounted the castors. I used cabinet hinges which gave me plenty of play for adjustments, they also come apart in two parts which makes it easy to remove them to put a finish on. The side of the hinge that rests on the door needs a 32mm hole bored using a forstner bit and is secured in place with two screws, the other end is simple secured in place with just screws. I then sanded all of the joints smooth with some 60 grit and the rest of the surfaces with 80 grit. With all of the surfaces smooth I applied the first coat of varnish. I thinned down the first coat with white spirit, this makes the varnish absorb better in to the plywood. The next day I lightly denibed all of the surfaces with some 180 grit. I ensured that there was no dust left on the sanded surfaces by blowing compressed air on them. The top coat was then applied and left to dry over night. I was then able to re attach the doors and I had a finished cabinet! Some of the things that I really liked about the cabinet was that I was able to get all of the joints flush making it look more aesthetics, the finish also turned our very well leaving a smooth surface on all of the faces. Two things that I would improve next time is to have adjustable shelf studs on the interior panels, this would involve making a jig with a series of holes drilled all the way through at set intervals that would hook on to the base of the part to ensure that all of the holes where consistent, this is a much better alternative that to permanently install fixings in one place for one shelf. 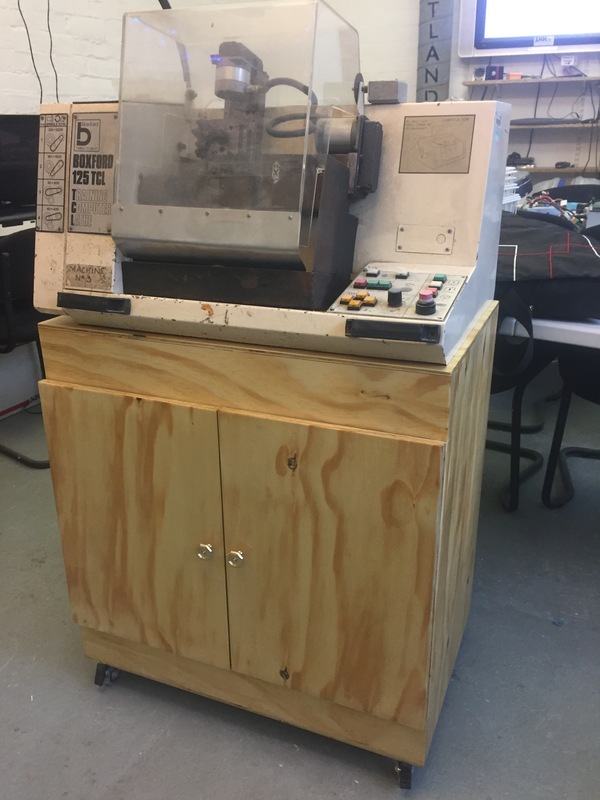 The second thing that I would add is some flight case style handles on either side of the cabinet to make manoeuvring it around easier, the lathe itself has two handles at the front for handling but is is much better that is is moved around by pushing the cabinet so that the lathe dose not inadvertently slip on the surface. This has overall been a really great project and I am hoping to do some more cabinet work in the not so distant future! For more build images visit my Flicker page. 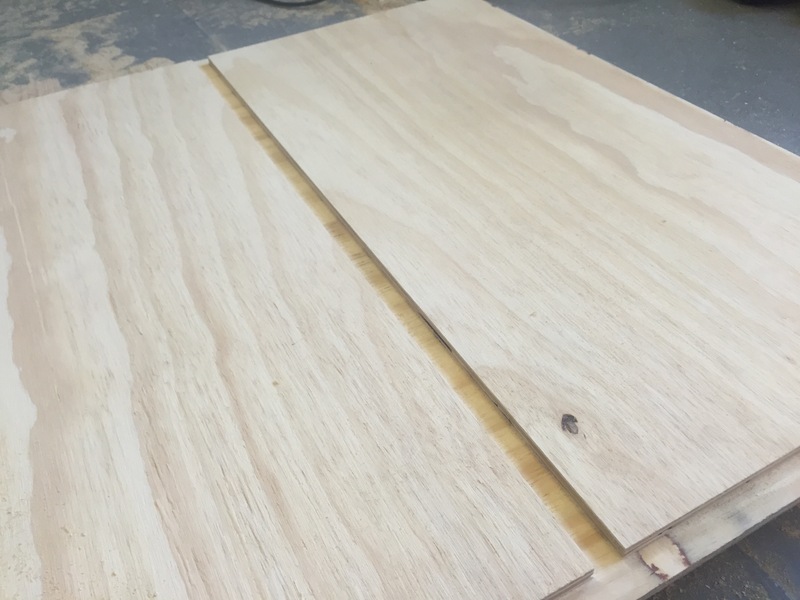 This entry was posted in Joinery on March 13, 2016 by AJ. 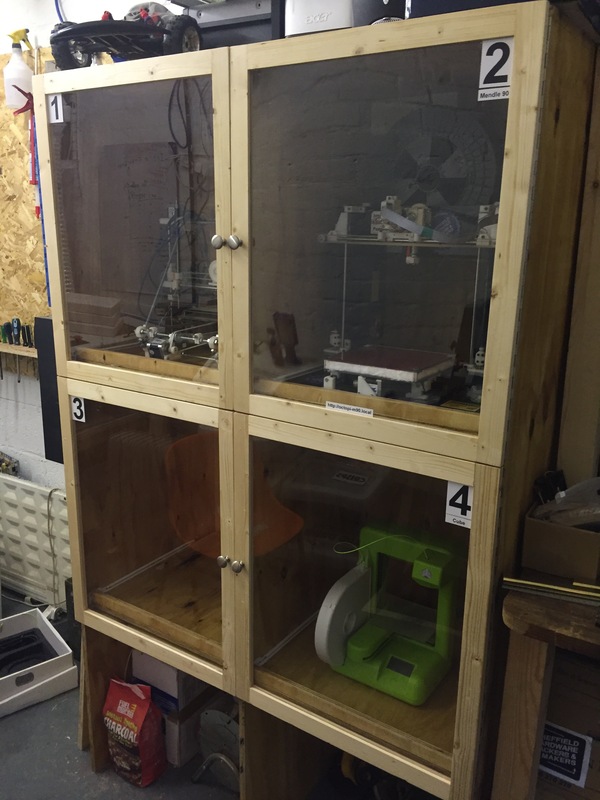 The Sheffield Hackspace needed a better set up to make there laser cutter more accessible and easier to work around. Currently there was a small temporary bench with an old desk worktop on it. 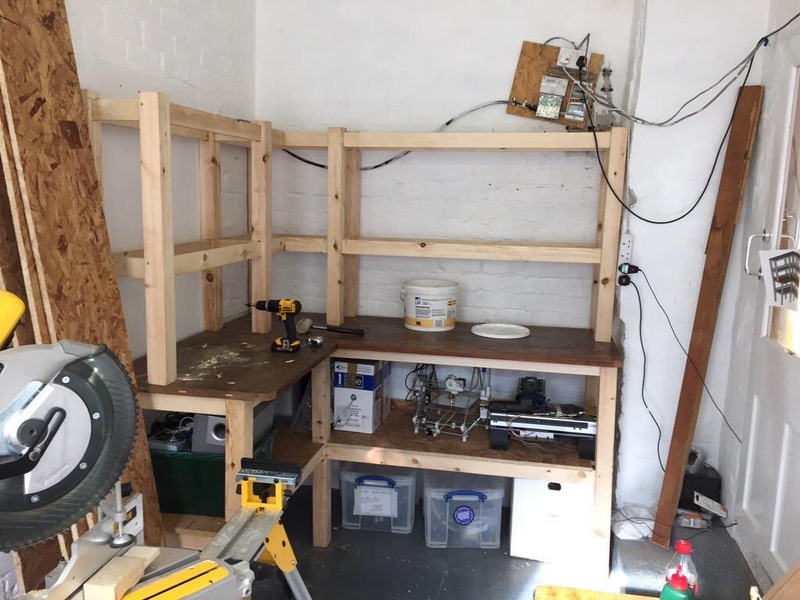 It was not the most stable work surface in the world and there was very little work surface for assembling parts etc and the current bench didn’t provide much storage space because of the height of it’s shelf. The high of the worktop also needed to be increased as some people strained to lean over and operate the laser cutter. With these points in mind I began to sketch out some ideas on paper. 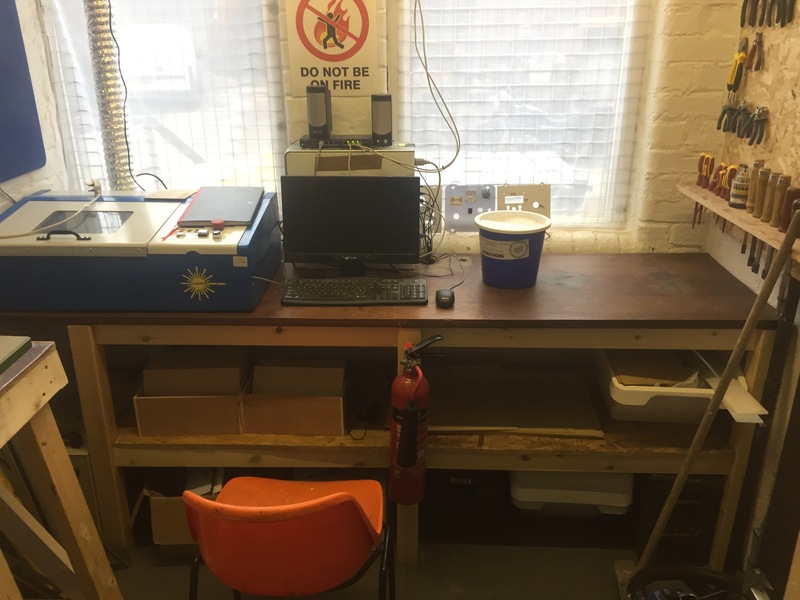 The current bench was sat in front of the window at the far end of the workshop and was 1350mm long, the new bench would span the width of the workshop at 2400mm. There also needs to be room to incorporate the laser chiller this was 280mm wide the easiest way to make a place to put it was to shorten the whole frame down to 2100mm and let the worktop over hang the gap, as for the height it was brought up to 925mm, at this height the work top would sit level with the windowsill. 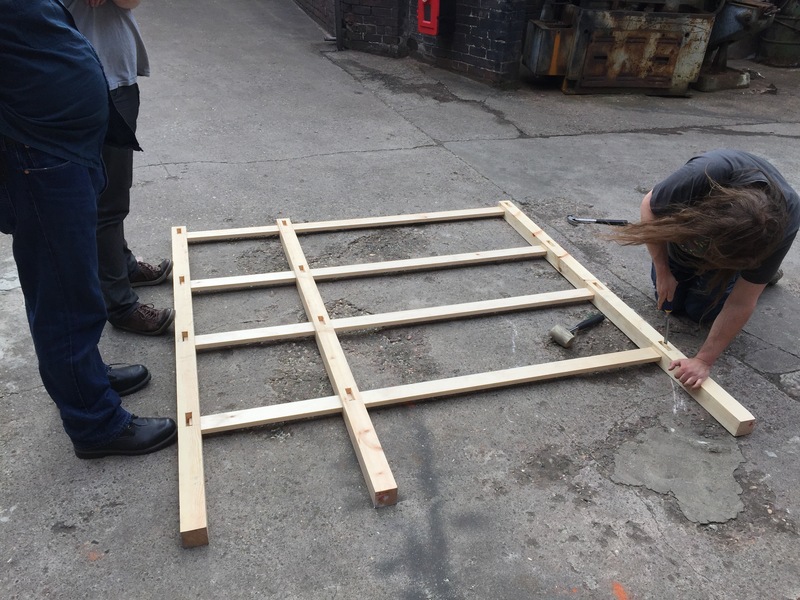 The bench frame will be supported with 6 posts and joined using through morits and tenon joints, There will be a shelf running through the centre for storage of large sheet goods. I drew up a 3D CAD model using FreeCAD to plan out the design. With the 3D model made and all of the timber cut down to length the mortises where marked out. To ensure that all of the measurements where consistent I marked all the heights of the mortises on an off cut of ply the same height as the posts. This was then held flush with the base of the post whiles the marks where transferred over and extended with a square, with that done the width of the mortise was marked on using a mortise marking gauge. Using a 15mm forstner bit set to a depth of 45mm in the drill press I removed the bulk of the waste material. Followed the rest of the waste material being removed with a chisel using the same technique u sed in previous projects, this was process was repeated for all 24 mortises. 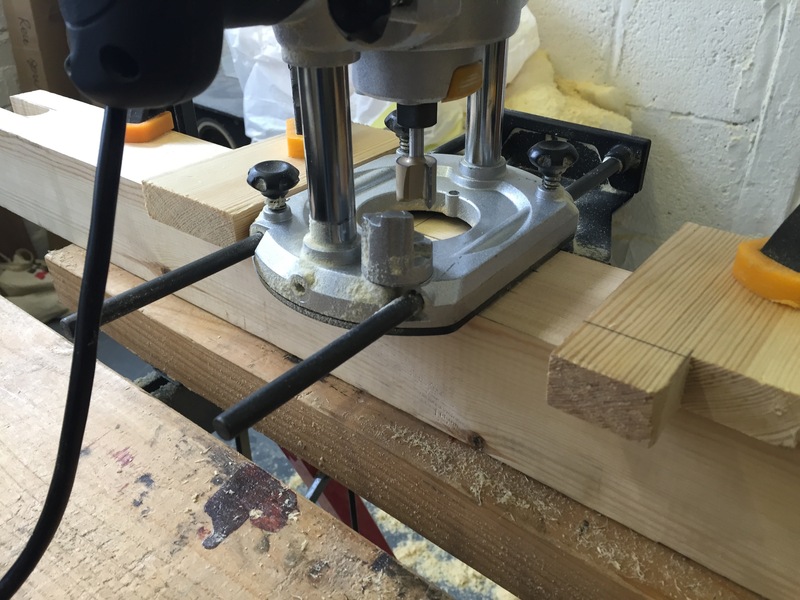 I then rounded over the edges of the posts using a 1/2″ round over bit. The ends of the through tenons where cut using the band saw, I set up the fens and a stop block to cut the ends accurately. With all the ends of the through tenons cut I began to assemble the middle, left and right hand side sections. Glue was applied in the mortises and the through tenons where inserted it to the mortises. The assembly was held together with a pair of sach camps whilst I drilled a countersunk pilot hole and drove a screw. With the 3 cross sections completed I began to assemble the frame together by laying down one end section and applying more glue in the mortises then setting the 4 cross shelf supports in place and driving a screw in from behind. I then added the middle section and repeated the same process for the top half of the bench. I then turned the workbench around the right way up and butted it up against the wall on the right. I cut two shelf’s out of OSB and fitted them around the square posts then dropped them in place. The worktop was then cut to length and width, for transportation purposes it was cut into two separate pieces. It was then secured with a screw countersunk in to each corner of each half of the worktop. 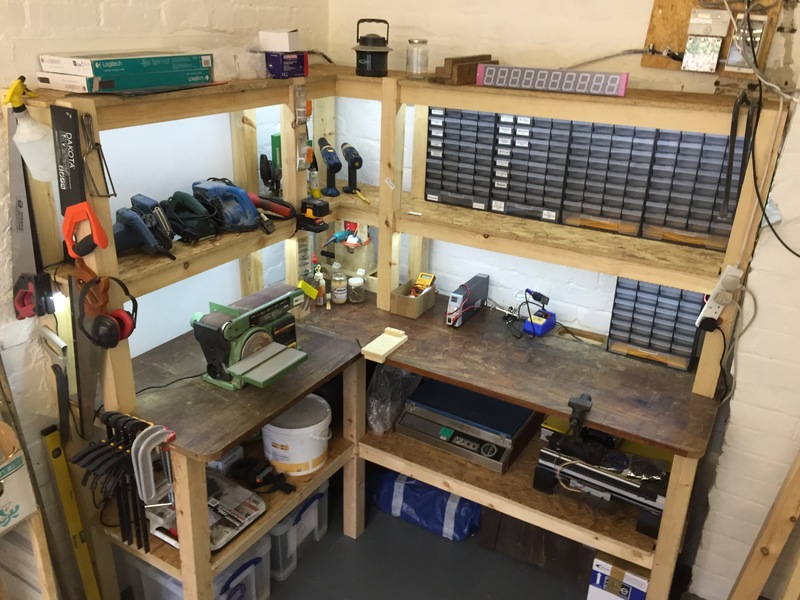 Overall this has been a great project and makes much better use of the back end of the workshop, there is more room for assembling prototype models to the right and an additional shelf for storing consumables. The bench is strong and sturdy and it will take many years of use to come. For more build image visit my Flicker page. 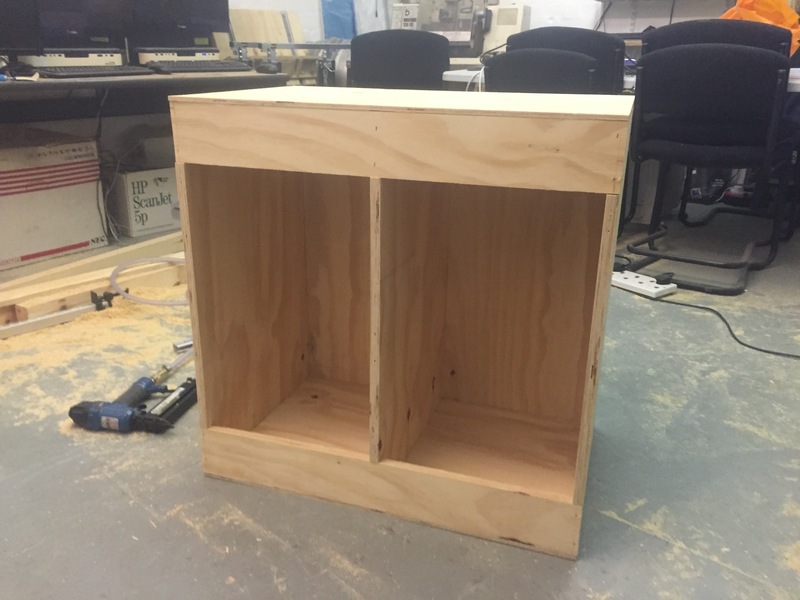 This entry was posted in Joinery on January 31, 2016 by AJ. I had been tasked with the job of building a replacement kitchen unit to replace an old one that had been ripped out during refurbishment works at Sheffield Hackspace The space needed somewhere that people could make food and drinks but also served as an area for PCB etching and other activities using hazardous chemicals without the risk of cross contamination. Provide a space under each of the sinks to accommodate a water heater at one end and a space for a bucket under the other. The bench will span 2600mm wide and stand off the wall 600mm. There will be a sink situated at either end, the one of the right will be for food and drinks it will have a water heater sat below, the sink on the left will be for handling hazardous substances when doing activeness such as PCB etching, when these types of activities do occur the trap of the sink can be removed and a bucket can be placed below. There will be a shelf in the middle of the frame that will be used as storage. With all of this in mind I needed to choose some material to use. I decided to go with some PSE (Plain Square Edge) timber. I used 69×69 for the posts and 20×69 for the through tenons. 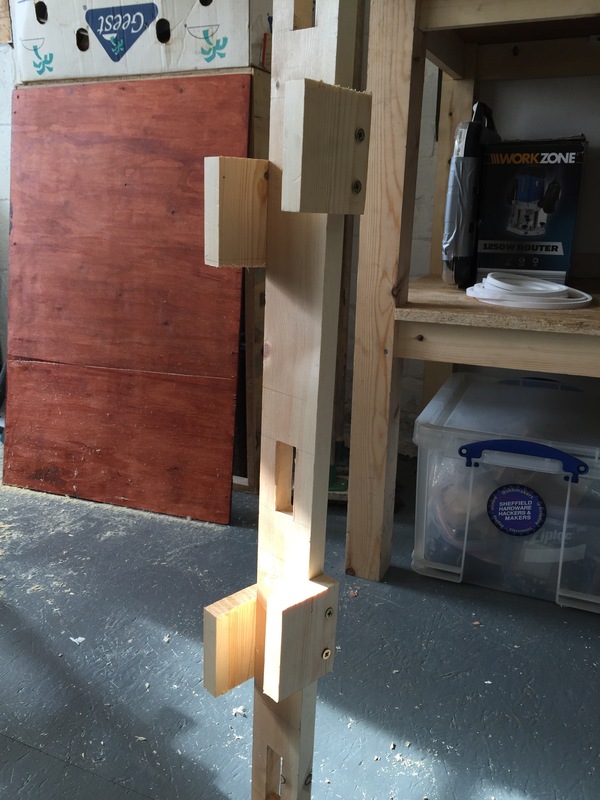 The frame will be constructed using a series of mortis and through tenon joints. 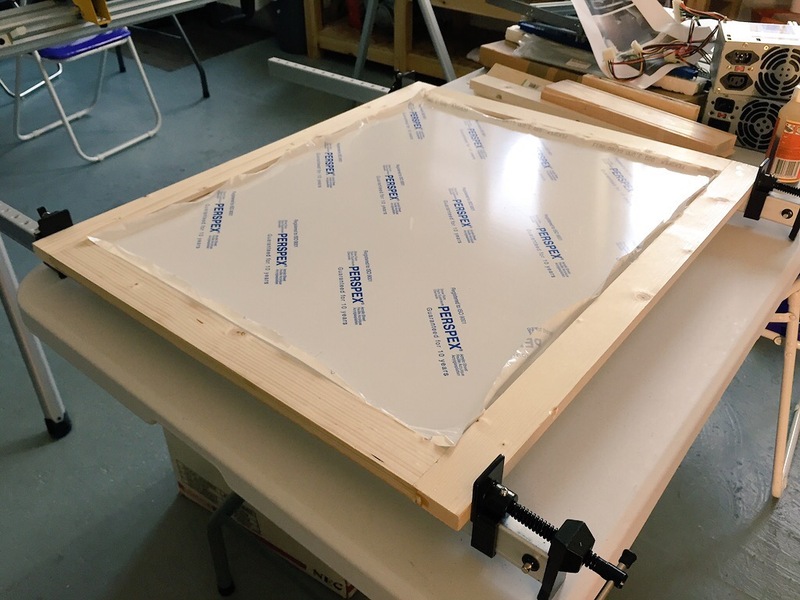 The reason I have opted for this method is because they are a strong and reliable joint because it gives you a large surface area to apply glue to. Now that I had all of these details I could begin to make a model to work to, I used FreeCAD to design the frame. You can see that the two rectangular areas that are directly below the sink openings leave space for a water heater on the right and a bucket or tank on the left. The OSB shelf on very bottom is split in four sections, this is so that the boards under neigh the sink can be replaced in the case of any water damage. The central shelf allows for additional storage, all of the posts have had there edges rounded over to give them a more aesthetic look and smoother to touch. To begin work I started by cutting all of the material down to the required length using a mitre saw. For cutting a series of components witch were all the same I stacked the material on top of each other and ensured that the end was square, this way I could get up to 4 of the same lengths at once saving time in the build. After this process had been completed I moved on to marking out for the mortises on the posts. Whilst doing this I realise that it would be much easier to use some form of a jig to do the marking, so I decided to make one. As shown in the image below there is a base set at 90 and four supports on either side to keep the post square and the mortises marked out at the corresponding heights. All I had to do now was to place the posts in the jig and draw the top and bottom line then join them together using a mortis marking gauge. With all of the mortises marked out I used a plunge router with an 18mm 2-flut cutting bit. I set up the fense on the router so that the cutter was positioned in the centre of the post, the depth stop was then set to 45mm (2/3 the way in). I clamped two pices of scrap timber on either side of the post to prevent me from inadvertently overshooting the mortise. When routing the mortise I went down in 3 passes when removing material. Now this task had been completed I rounded over the edges of the posts using a 1/4″ round over bit. I ran the cutter over a scrap piece of timber first to ensure that the router was set correctly and make any adjustments if needed. With all of the mortises routed they where squared off using a chisel. For cutting the through tenons I marked them up using a combination square. 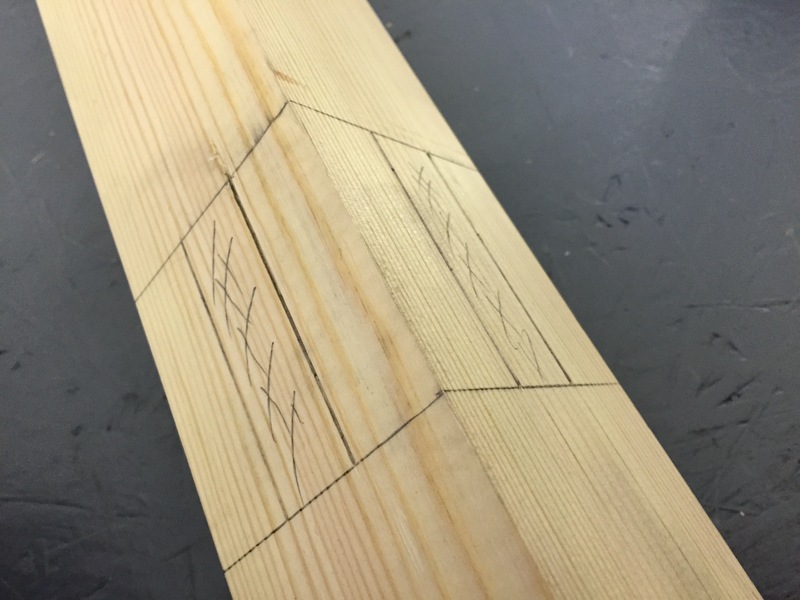 Each tenon has either 1/2 or 1/3 x 20mm removed from the edge, the 1/3 tenons are for the central sections where ‘T”s are formed. These joints where machined using a band saw, I set up the fens and an end stop so that I could run through all of the necessary parts before resetting the machine to of the other 1/3 through tenors. I now begin to assemble the frame, I started by assembling the two rectangular shaped units that would sit on either end, these two individual units would be joined together by the cross shelf supports making it one unit. The joints where fixed together using an expanding glue which fills gaps. 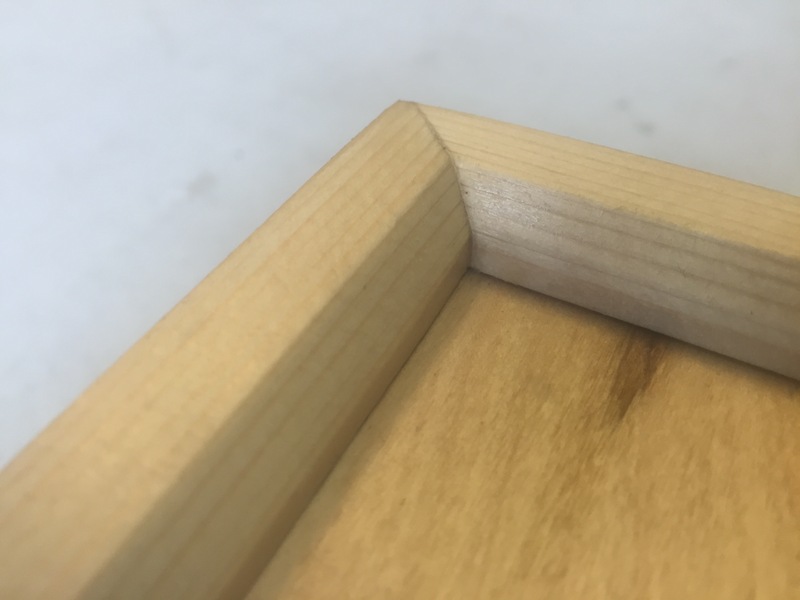 Once glue had been applied to the joint and the through tenon had been inserted it was secured in place using a few wood screws, this pulls the joint tight and prevents it from setting uneven or out of square. Once the two end sections had been created I set out to join them both together. I laid one of the side units on its side and glued in all of the 6 through tenons and secured them in place. 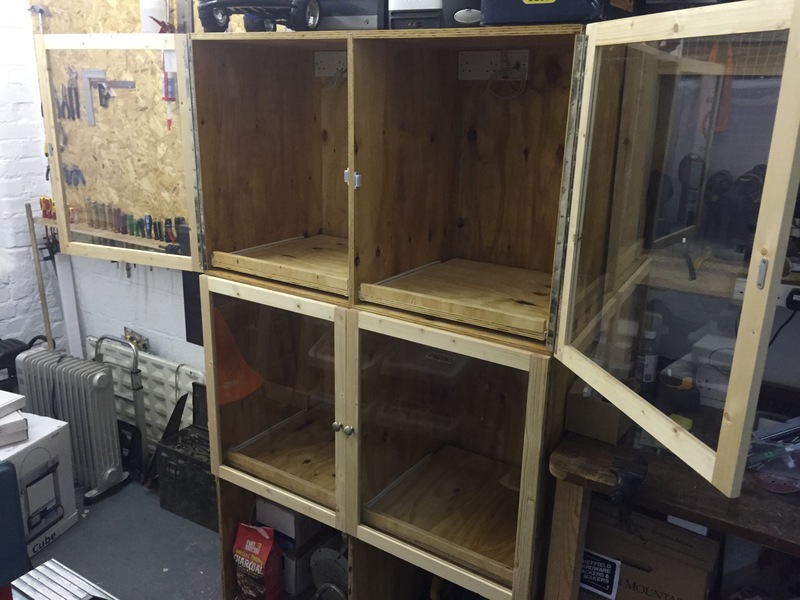 I then proceeded to measure and cut out some shelfs for the frame, I used 18mm OSB. 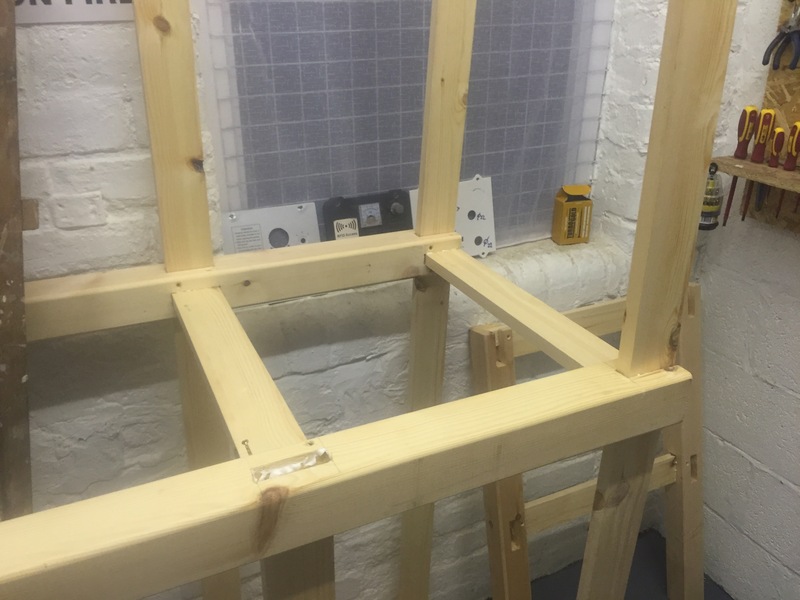 The bottom section of the frames shelfs where cut individual in four sections, this was the same for the central shelf but this time it was split in to two parts, A number of screws where then added to keep the shelfs held down and secure. 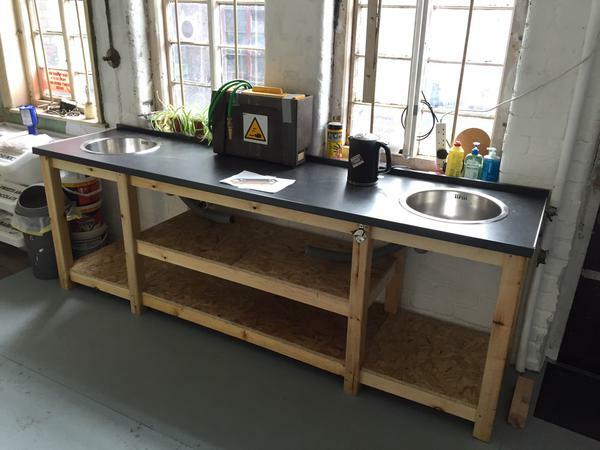 The worktop was then cut size and mounted on top of the frame and secured in place. The two holes for the sinks where then cut out using a router and the taps where installed. All that was left now was to plumb in the sink and connect the taps up to the water main. Overall this has been a great build and I have gained more skills from doing so. If I was to do this job again I’d improve the frame design and make it and construct it as a cabinet using sheet materials. This in turn would then allow me to hang doors on the exterior, witch would make the presentation of the work surface much more neater. 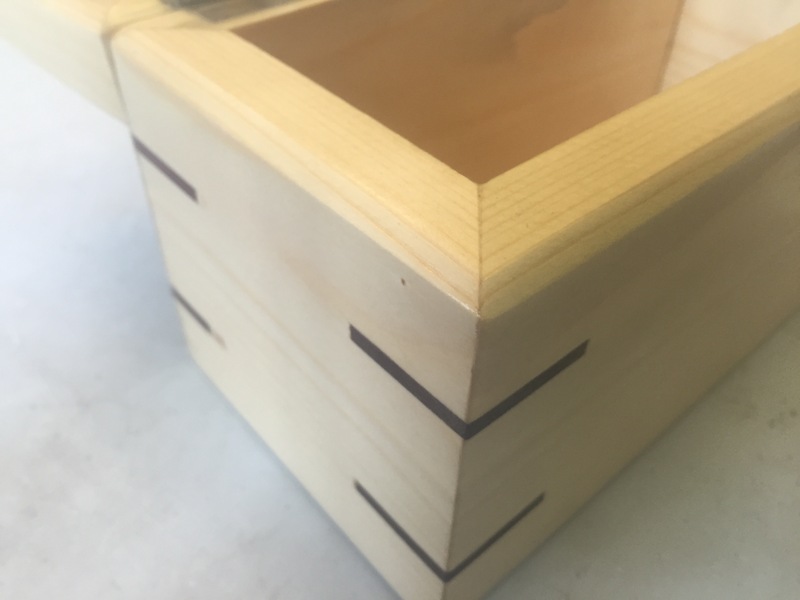 This entry was posted in Joinery on January 11, 2016 by AJ. – Provide a work surface that is suitable for people of all heights to work at. 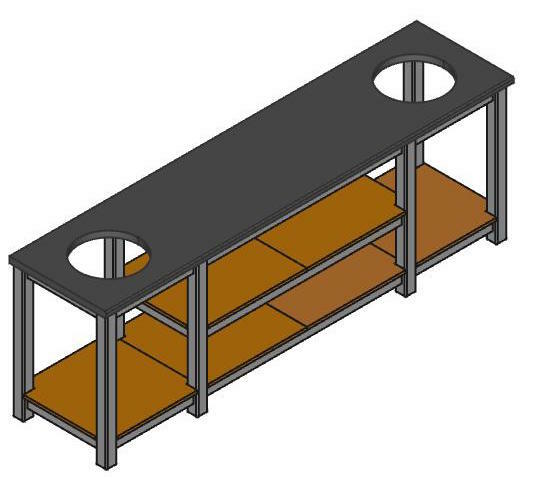 – Allow the front part of the bench to overhang the frame so that things such as vices and clamps can be secured in place. 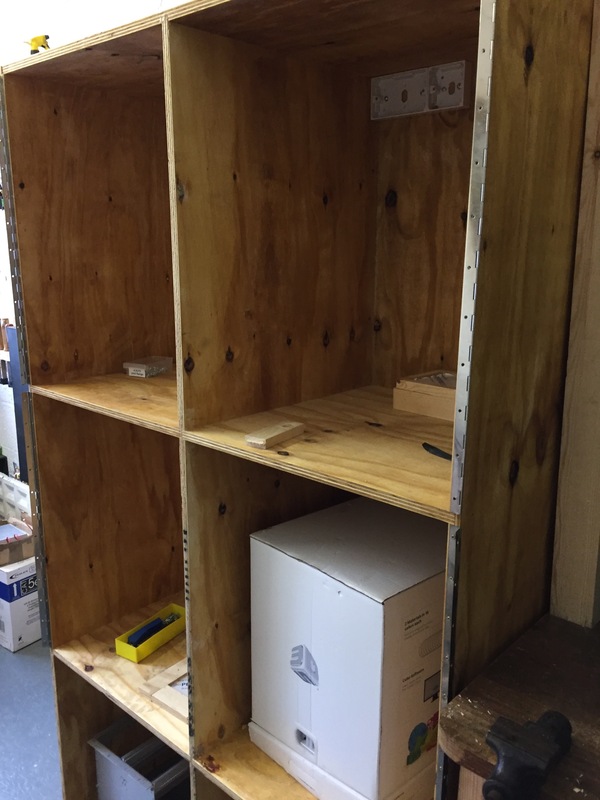 – Integrate storage shelf’s for boxes and tools both above and below the work surface. 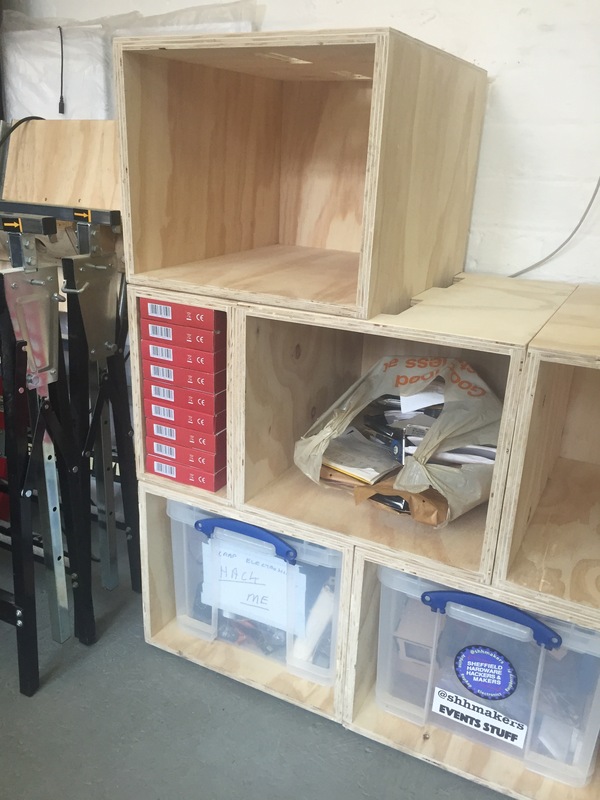 – Utilise as much space as possible to increase storage area at the back section of the workshop. 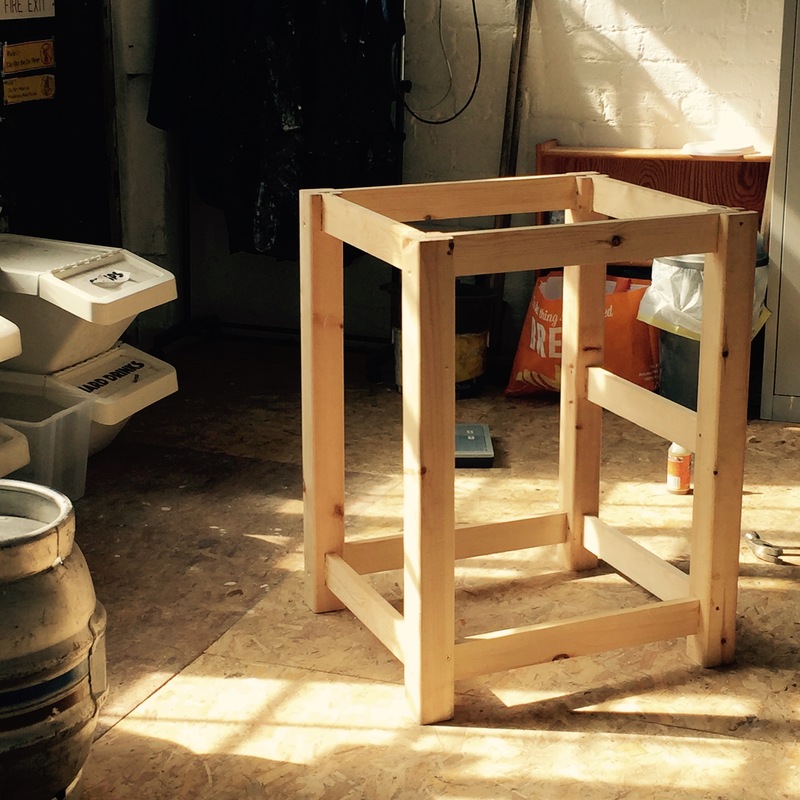 – The work bench must be free standing as it is being constructed in a grade 2 listed building. Now I had a list of criteria to work to I could start to plan out what process I am going to use. My plan was to use through mortise and tenon joints. With this in mind I began to sketch out some ideas. Below on the left you can see the area that the bench would be constructed in. 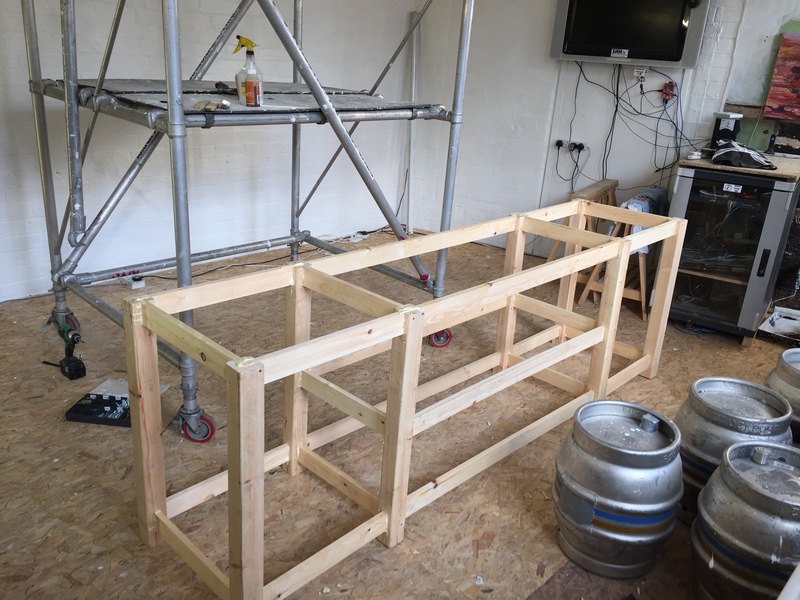 The workbench would be an ‘L’ shape, it would be 1900mm wide spanning the width of the rear wall, 1200mm from the back of the wall down the left hand side of the wall, the frame will be 600mm wide, the worktop height will be 1025 and the overall height will be 2000mm. You can also see the sketch that I made of the location where the support posts would be positioned. By now I had a good understanding of what I needed to accomplish. In order to plan out how I was going to construct each individual component I started to draw out a 3D model of the workbench in FreeCAD. Each of the individual components that made up the frame had to be designed individually. The construction consists of 8 vertical posts that support the through tenons witch are fixed in to. 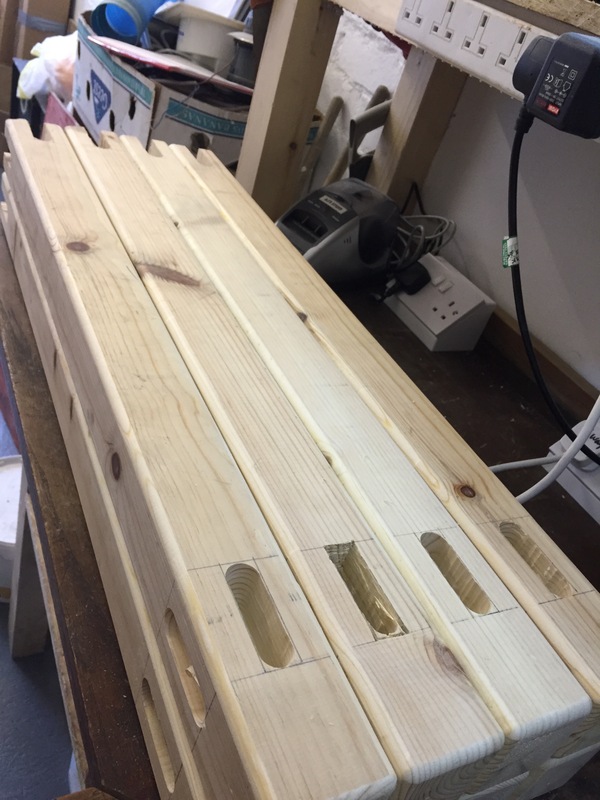 The 5 posts that surround the perimeter of the two walls are 2M tall, these will support the back half of the shelf’s that will rest above the work surface. The other 3 the posts surrounding the front perimeter will support the work surface from the bottom side of the work top and the shelf’s below. Once all of the individual parts have been produced in FreeCAD they are exported as .step files so that they can be imported in to one model and assembled. The individual parts can then be moved around in different dimensions to make them all fit together. 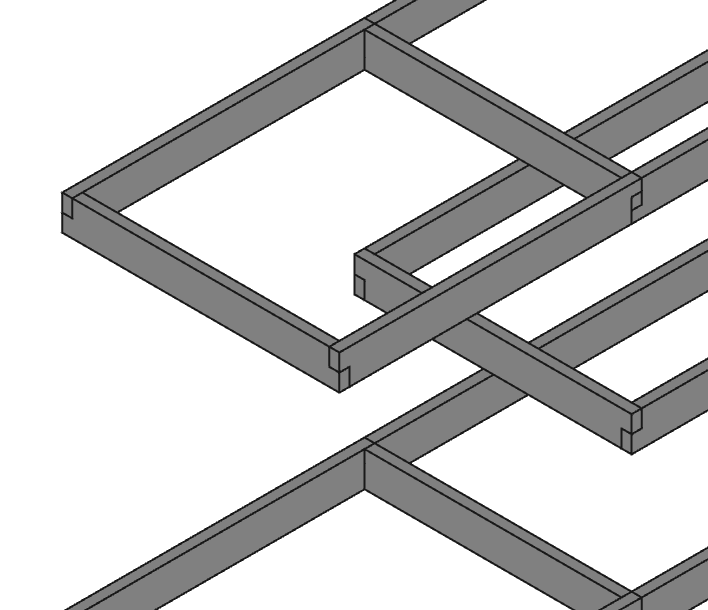 At the stage of assembling the parts it is clear if the design is going to fit together as intended, if say for instance a mortise has been placed to far down from the tenon to fit in to it at the correct level, this can be addresses by going back to the individual part and edit the mortise to the correct height. Now that I have a design in place I can begin to cut the material to length. 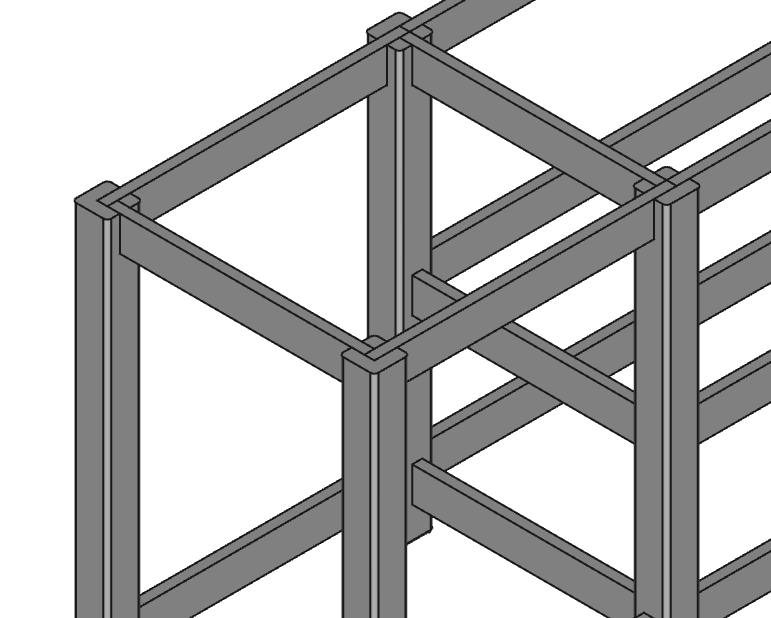 The supporting posts are 70×70 and the through tennons are 20×70 redwood PSE. All of the individual parts where cut to length. For the through tenon lengths that where all the same length I stacked 3 lengths of stock on top of each other and lined the ends up squer, not only did this save time but is also more accurate because they where all cut at the the same because one end of all of the material was square. To mark out the positions of the mortises I used a tape measure, square and mortis marking gauge. I marked out the height of each mortis from the base and marked out a line on to the other relevant sides using a square. This process was repeated on all of the supporting posts. 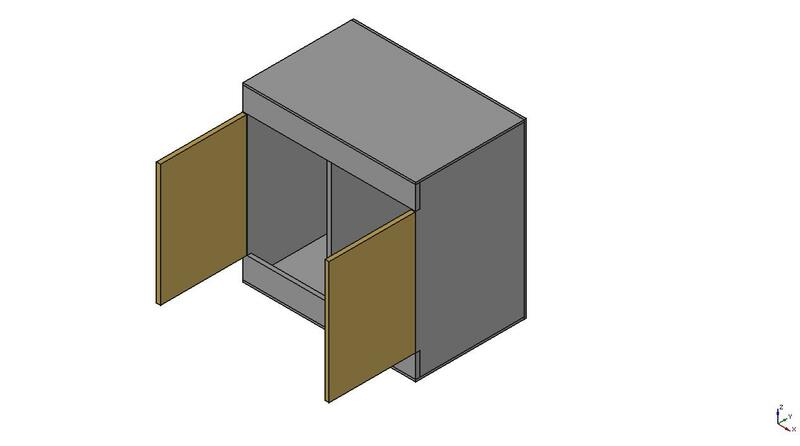 The image below shows part of a post that has been scribed out, 2/3 of the material will be removed from each side that has been marked, this section marked out is section where two through tenons will be seated to form a shelf. Once all of the joints had been marked out I set up for machining. To drill out the material I used a used a drill mounted vertically in a plywood jig witch was made by a friend. The jig was made in two parts, the first was the base witch held itself central to the post with two bits of ply fixd on either side of the base. The other part of the jig was joined to the base by a set of sliding rails, with makes it easy to manoeuvre. 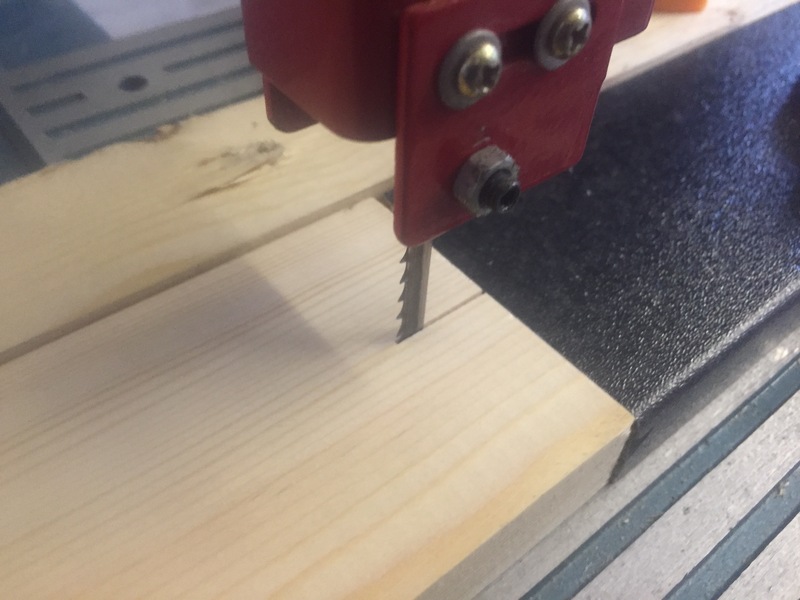 The last feature is the depth stop, this was incorporated by using a bolt and two nuts, it ensured that the spade bit did not travel more than 45mm in to the timber. There are three different types of posts in the workbench, the first have two mortises that meet at 90° the second has three mortises that meet as a ‘T’ and the last has a mortise on every side that meet as an ‘+’. The 90 posts sit in the far corners, ‘T’ posts sit in-between the posts in the far corners and the ‘+’ post sits directly in the middle of the frame supporting the central weight. Once the bulk of the material has been drilled out of the mortises they are ready to be squared off. I started by cutting around the perimeter of the mortise, I did this by setting my chisel on the line and tapping it gently with a mallet to set in in place to stop it from slipping, I could than continue with a stronger strike to remove more material. Once I had been around the exterior of the mortise three to four times I could begin to start and lift material out. With the bulck of the waste removed I used a wider 25mm chisel to pair back additional material from the sides until the tenon fitted snugly. Now all the posts and through tennons have been mortised and squared off The individual sections that make up the workbench where offer up to each other before glueing. Offering up all the separate sections as shown below ensures everything will fit together as intended once it has been glued up this gives me the opportunity to pair off any excess material in the mortises using a chisel. The workbench was assembled in three main sections, the back, the left hand side and the middle. I used an expanding glue witch was moisture activated, because this glue expands it fills gaps at the same time. The image below shows the back and left hand side being glued up. Once all of the back rails has been slid in to place along the back and side glue was applied in to the mortises, the tenon was then inserted in to the groove and a screw was driven in to hold the components in whilst the glue set. Once the frame had been completed the shelfs and worktop where installed. The shelves are 18mm OSB cut to size, the worktop is a piece of 25mm thick teak. 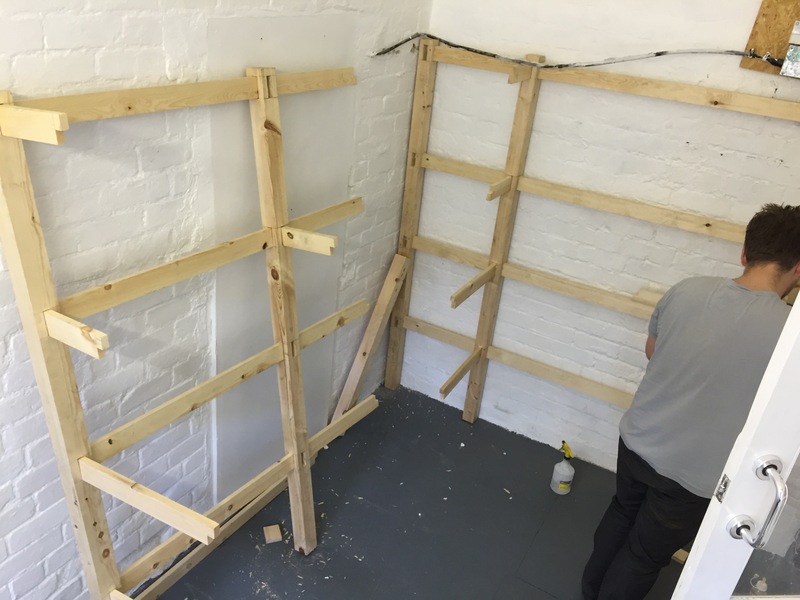 To install the shelfs a measurement was taken of the length and width of the opening. Once this had been cut to size it needed to be shaped around the posts. The square cut outs for the posts where marked on and cut out. The shelf could then be fitted in place. The worktop was mounted in two sections, the first was the pice that runs the length of the left hand side, towards the front side of the workbench a notch was cut out at 45 to allow the other pice to be seated on the rail with a corresponding notch in the other section of the worktop. With the worktop set in place the shelf support posts for the upper shelf’s where glued and inserted in to the cross tenons followed by a piece of OSB for the shelf. Overall this has been a great build and has produced some excellent results. 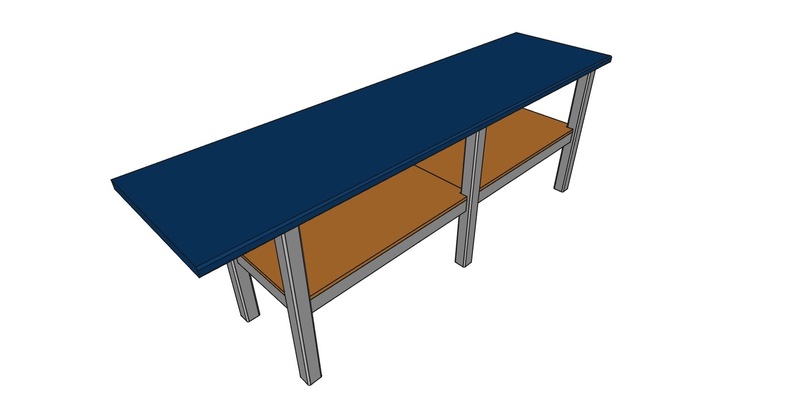 The workbench fulfils it’s intended purpose, because of the method of joinery used it is a solid structure that will and will take many years of use. The worktop is at a suitable working height, an improvement witch I feel could be made is to install a backstop to prevent things from falling behind the worktop and add at least 4 double plug sockets along the back secured in angled back boxes, this in turn provides better power access for power tools and battery charges etc. 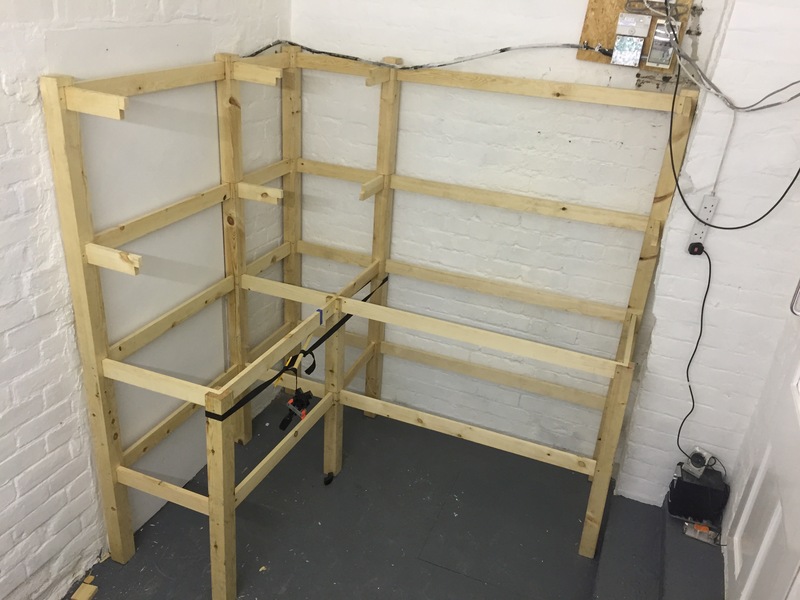 The lower shelf’s make plenty of storage space for pats and components, as for the upper smaller shelf’s make an ideal place to put component trays and store power tools, it gives quicker access to the kit that will be used most often. I have enjoyed doing this build and have learnt some new skills along the way, I’m looking forward to future projects identical to this. With the Sheffield Hardware Hackers and Makers Hackspace having a collection of three different 3D printers and with them all being kept in one multi use workshop, it soon came apparent that we needed a way to keep the dust of of them all whiles also allowing us to gain easy access to them for maintenance. There was an ideal place in the workshop between the workbench and tool board where a cabinet would sit nicely. With this in mind I took some measurements of the area and make a few rough sketches on paper. 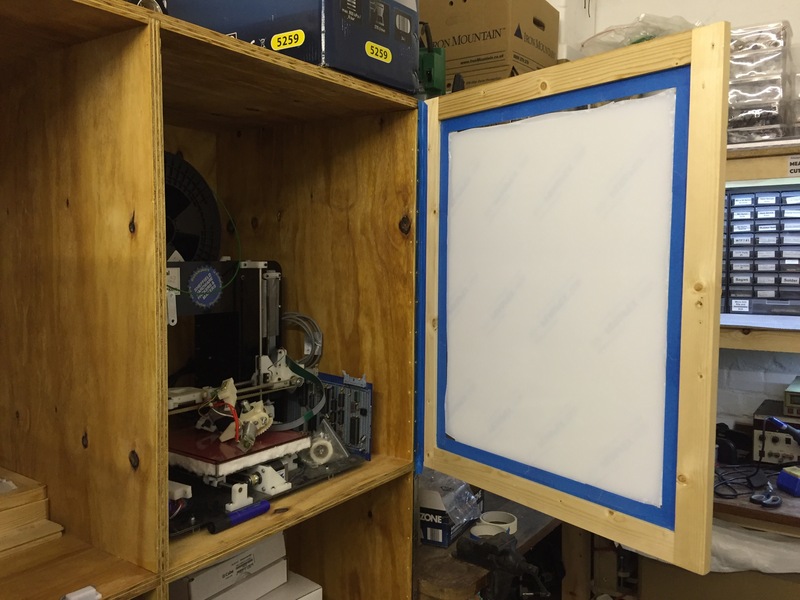 The cabinet would be 1200 x 600 x 2000 it would be divided up in to 6 quadrants, the top 4 quadrants will be where the 3D printers would be housed and the bottom two would create storage space for reels of filament and other consumables. 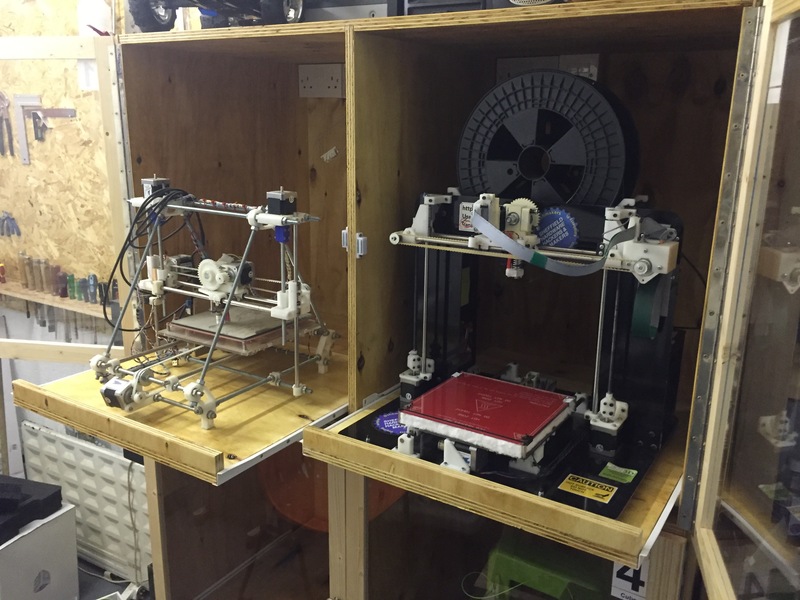 At the rear of each of the 4 printer quadrants there would be a 2G plug and RJ45 socket as each of the printers will run of OctoPi allowing the printers to be controlled remotely on the network. 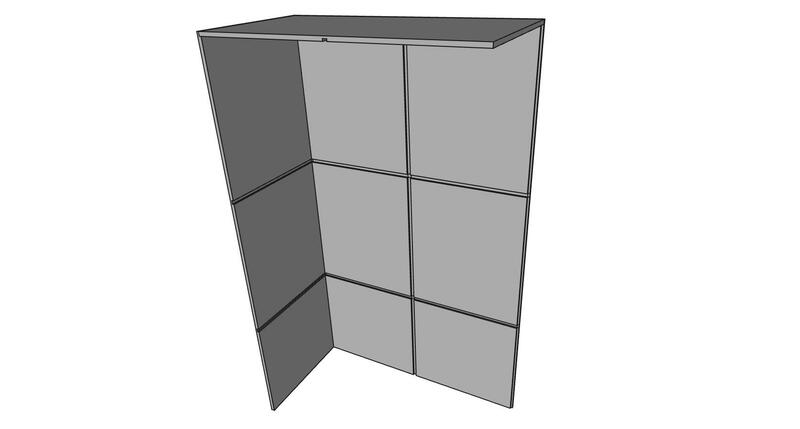 Once I had a feel for what the cabinet was going to look like on paper I drew up a 3D model using Free CAD. 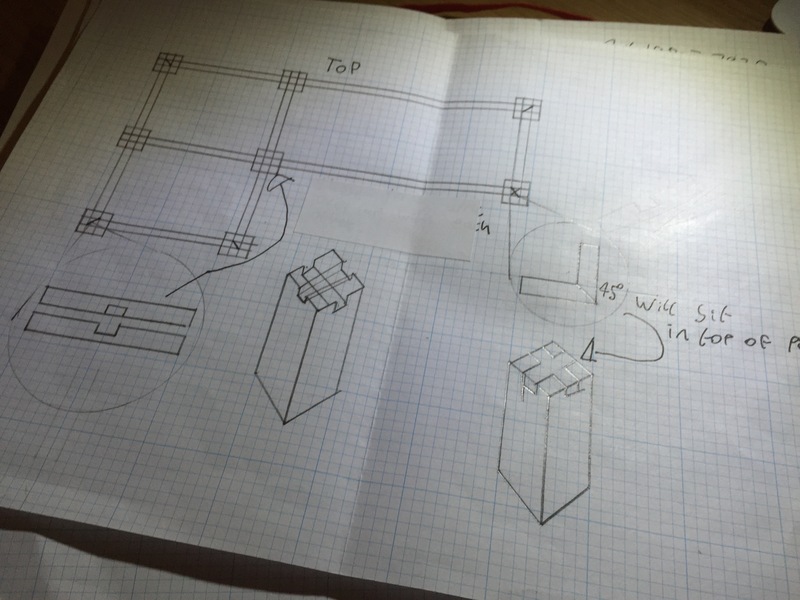 This entry was posted in Joinery on December 30, 2015 by AJ.